Dressed on earthy tones - Do You Speak Gossip?Do You Speak Gossip? Hello everyone! I hope you had a great weekend and a fun Monday! Mine were supposed to be really full, but like every time this happens, I suddenly ended up staying at home, because for some reason, everyone canceled. Does this ever happen to you? To be completely booked with appointments and stuff, and have to turn down other proposals and after you do, your original appointment cancels and it’s too late to do anything else? It’s really annoying, but at least I found some time to stay at home and do the things that I was putting off for later. Like reading all the blogs I follow, that have been piling up and I hadn’t enough time to read them. Anyway, I have an outfit post for you today. It’s been a long time since I last showed you one, that wasn’t over a month old (like the ones I’ve been showing you from Nafplio). Hope you like it. The coat is actually double face. You can wear it both ways (inside-out). I added some minor details on the blog these days, like the snowing effect. I thought it was a nice way to put you on Christmas mood. I hope it doesn’t slow down your computers or the loading of the blog. It actually makes me smile every time I refresh the page. Wish we have some snow around Christmas this year. I have some other things on my mind for my blog, as I want to change it a bit, since I’m not yet completely satisfied with its look. It’s the first anniversary of my blog next month , and I hope I’ll have something special to show you until then. But I can’t promise anything, since I’ve been really pressured lately! But stay tuned for more details and don’t forget to follow (Preferably on Bloglovin’ or Facebook, since GFC is going to be canceled from March 1st 2012 for non-blogger blogs). Na mpo sto thema loipon. Mou aresei para ma para poli to outfit sou! Latreuo ta polla layers kai ta exeis tairiaksei poli omorfa! Mpotes kai tsanta einai erotas kai se poli oraies apoxroseis! Great outfit! Filakia! An kai den eimai twn gihnwn xrwmatwn, to outfit einai poli omorfo. S’euxaristw poli Maria mou! To diplis opsews palto anike palia sti mama kai ti theia mou! hehe poli xairomai na vriskw tetoius thisaurous…Krima na min imouna kai ligo pio adinati na mou kanane ola tous ta palia sinolakia! I love the structure in your bag. And the color is perfect for an earth tone outfit! Such a great outfit!Love the bag and the coat! I loooooove that coat!!!!! I love the idea of wearing both sides! I took a look to see where you bought and then oh nooooo, vintage! But amazing, for sure! 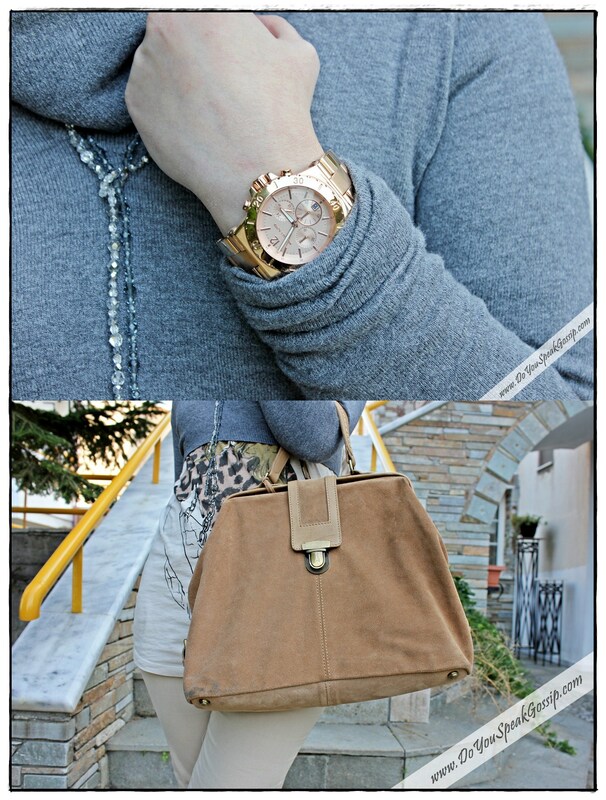 You know I love that watch and I am a great fan of your bags! But I liked two things now, very much! The boots! Fantastic! The color, the style! I loved them! And the second thing, please, don’t try to convince me saying you didn’t lose weight, because you did, and a lot! You look sooooo thin, you could be now an Elite Agency model!!!!! You look so beautiful, as usual, but I especially loved this outfit, proving that even trying to be casual, you look so elegant and a trend-setter!!!! If you find such a coat again, please tell me!!!! haha Than kyou Denise! The truth is that unfortunately I didn’t lose any weight, but I do feel too that I lost some centimeters. But I haven’t check. I don’t lie, I use the same as I did. I’m not on a diet right now…I thought that too when I saw these pictures. It’s weird, but nice. I bought the boots last year, but the coat was my mom’s and it’s really old. But if I find something similar, I’ll let you know. Η γήινη παλέτα χρωμάτων είναι αγαπημένη!! Σου πάει πολύ με τα χρώματα σου.. Ωραία εμφάνιση!! Μοντέρνα Σταχτοπούτα recently posted..Μάθε πως να διακρίνεις τις πιο Άνετες Ψηλοτάκουνες Γόβες. Τα χαρακτηριστικά που θα σε κάνουν να επιλέξεις σωστά. μου αρεσουν πολυ τα χρωματα που επελεξες!!! caramellitsa recently posted..Sock me up!!!!!!!!!! your coat and boots are equally fabulous. i was going to say i liked the contrasting belt of your coat…very cool that i is reversible! that’s getting your moneys worth! Πολύ όμορφο outfit γλυκιά μου!! Η τσαντούλα τέλεια..
Pingback: Boot-licious | Do You Speak Gossip?